As is the case in almost any industry, your work is only as good as your ability to communicate it effectively. 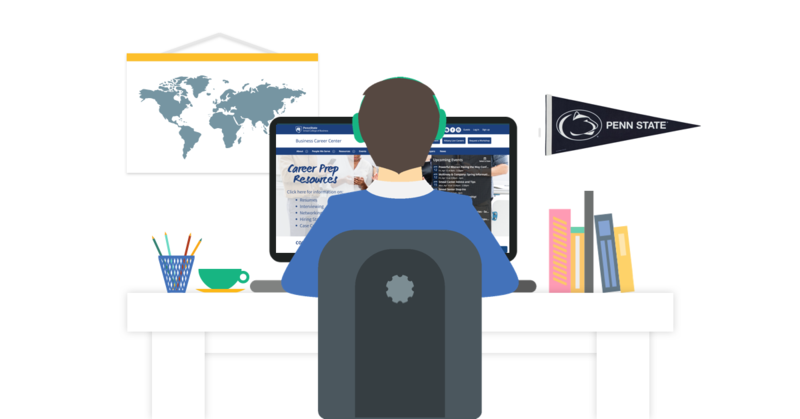 Your career services team, and your institution as a whole, work hard to curate specialized resources, services, and opportunities to support students. Your good intentions aside, often times engagement with these resources is unpredictable at best - or disappointingly low at worst. Not only is the hard work of your staff and admins being overlooked, there’s lots of research that points to a correlation between engagement and general persistence. Very simply, when a student doesn’t engage, they are less likely to be retained. With more online tools and resources available to support students than ever before, investment in these resources continues to rise, sometimes as part of a big picture strategic plan, and sometimes more randomly. Either way, to maximize engagement, career resources must be procured within the context of a larger delivery model so engagement with all resources is inherently and organically encouraged. Because most resources they were paying for weren't priced per student, it made is almost impossible to prove a return on the initial investment with such low rates of engagement. Needless to say, priorities were adjusted. Without a way to effectively engage students with the resources they already had, adding more didn't seem like logical choice. Worse, without a plan in place to communicate how and when students should utilize said resource, they ran the risk of making the student experience even more confusing and disorienting. What resources do you have? List online and in-person resources, those you pay for, and those you've developed. Are your resources organized in such a way that certain student groups, say freshmen or international students, can easily identify its relevancy? How do students find out about these resources? Email, in-person appointments, word of mouth. Are you sure? How do other campus stakeholders find out about resources? Are they able to make recommendations to students? What are the learning objectives for each resource? Are these tools being proactively promoted? Is there a plan in place to encourage utilization of each resource? Is this promotion objective - does it come from you, the trusted career center, or does it come directly from the third party application? How many different communication channels are you using? Can you benchmark engagement with these tools so you can show increases/decreases?